There have been a surprising number of blogs, tweets, and bellicose bar conversations in protest of the NHL's decision to expand the number of outdoor games played next year. Yes, the NHL is cashing in on an already-profitable venture. But more than that, they are working to elevate hockey's place among the big four sports in North America. By having more outdoor games, hockey might not just become more mainstream but merge with the American psyche and/or cultural zeitgeist by becoming part of American counterculture. Along the same lines of Woodstock for hippies and the Krusty Burger's Ribwich for Ribheads, next year's outdoor games have the potential to create discrete cultural sub-communities among hockey fans. Here are a few possibilities. 1. 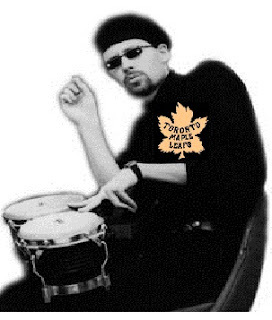 The Beat Generation: Like the previous beats, these fans feel beat down by the machinations of the NHL that have turned a fun, folksy sport into a billion dollar industry. To symbolize their disenfranchisement with the business of hockey, they wear the jerseys of defunct teams as they rove around the venues hosting outdoor games. They're not like the flash mobs of Quebec Nordiques fans who invade arenas to demonstrate support for the revival of an old franchise. No, the Beats have no hope in such restoration, so they wear California Golden Seals, Kansas City Scouts, Hamilton Tigers, and other jerseys with a sense of nostalgia that doesn't long for the past but indicts the present for murdering hockey's innocence. As a group, they bond by venting mutual feelings of being both under-represented and unrepresentable (note how "resent" forms both descriptions of this group) by mainstream hockey. They typically hitchhike from venue to venue, regaling drivers with elegiac tales of how the game has lost its grandeur and America, its wonder. Don't let the beret fool you: this guy can really wail a "Go Leafs Go" chant on the bongos. 2. The Wandering Warrens: Every in-door game sees a bevy of puck bunnies, but the outdoor games will attract roving warrens of those fickle fans of the game's physical form. Dressed as though even antibiotics are unable to resist their charms, these warrenites will crowd arenas with the same density as the villainous viruses in the latter stages of Dr. Mario. Incidentally, "Chill" (the blue virus) was intended as the microbial equivalent of the puck bunny. At first, these groupies will resemble the "band aids" from the movie Almost Famous, but as their numbers grow, their social organization will proliferate into mutually hostile, ideologically-opposed groups. Bands of libertarian puck bunnies will clash with communist enclaves that will, in turn, at times ally themselves with and at other points clash against fascistic groups of hockey hares. The power struggles between and assaults upon each group by the others will make the struggles of bunnies in Watership Down seem like a kid's book. Wait, Watership Down was a kid's book? Jesus! 3. The Mirthful Hippies: This group is more cohesive yet nonetheless chaotic than the warring warrens of puck bunnies. Part circus, part anarchist movement, these pranksters will offer the same entertainment value as Vancouver's Green Men except on a much larger and more menacing scale. 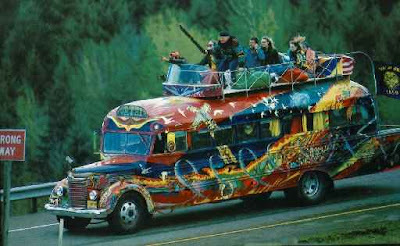 Gathering together in hippie-like communes, they will travel around in renovated school buses painted with team logos after the psychedelic aesthetic. As with a magic-eye picture, if you let your eyes unfocus, you'll see each NHL logo existing in perfect, cosmic harmony with each other. The problem with these hooligans is that they will persistently try to upstage the event they follow by making their mere presence a spectacle wherever they go. They will likely crash religious retreats to preach the gospels of their teams while administering Stanley-Cup superstitions like sacraments, and descend like unseasonal locusts on winter festivals held in communities hosting the outdoor games. Only a trail of regurgitated maple candy will portend the next destination to be enveloped by their fandamonium. Through these antics, these pranksters will bring havoc wherever they go in an attempt to vie against the teams they worship in terms of news coverage. In short, these fans are their team's greatest enemies.